Hockey fans across the nation are well aware of what’s currently happening with the NHL Lockout. I always associate winter with hockey games on TV and think it will be an adjustment to get used to no hockey nights in our home. However, just because there’s no NHL does not mean the end of hockey. There’s still the kid’s teams and the local Junior A teams so fans can still get their fill of the sport. My girls don’t play hockey, but I have cousins and friends whose kids still do. 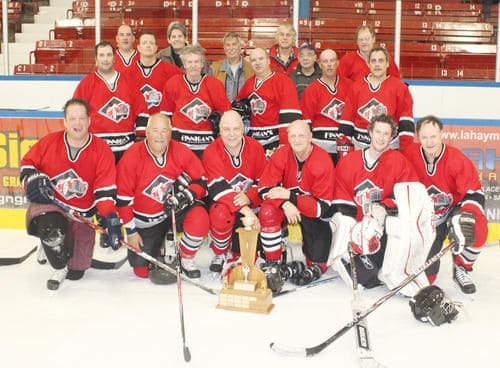 And then there’s my dad….he plays for in the old timers league and he is well into his 50s. My dad is in the first row, second from the left. 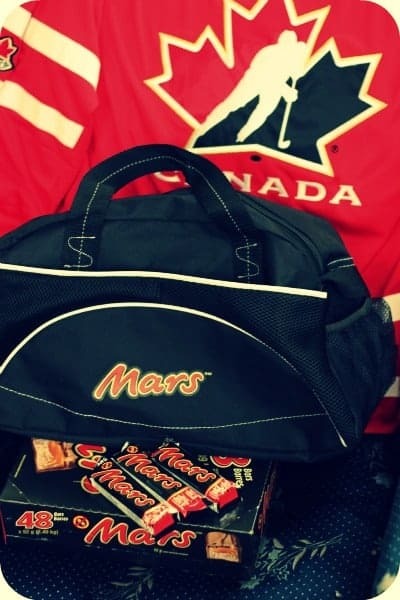 Mars Canada recently commissioned a survey and learned that more than 90% of Canadians live near an ice rink, but that most are unaware of the current state of their rink. This is where Mars Canada is stepping in to help. They have found five ice rinks in Canada that are in need of some TLC and are pledging up to $100,000 to fix them up. They need our help though! 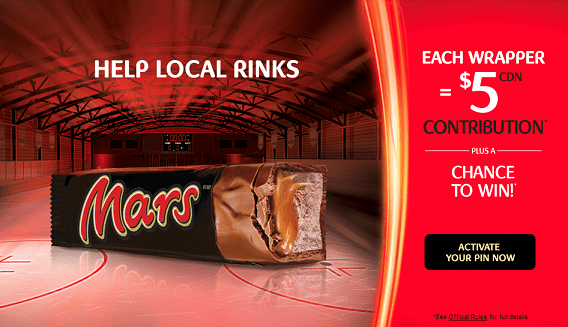 Right now when you purchase any specially marked Mars bars, you will find inside a pin inside the wrapper. Enter this number on the Mars website to activate a $5 contribution towards the effort. It’s really easy to do and only takes a second. If it’s your first time, you must register on the site and then input your pin found on the inside of your wrapper. There’s also Instant Win prizes! In fact, there’s 986,976 Mars coupons for a free 52g bar being given away. I haven’t won one yet, but maybe you will!! Next time you are out at the store, grab a Mars bar to enjoy and then save the wrapper for the pin and help this worthwhile cause! It’s something to keep our mind off what’s happening with the NHL right? Let’s help improve hockey rinks in Canada! Disclosure: I was not financially compensated for this post. I received a sample of the product as compensation. The opinions are my own, based on my personal experience with the product. Only a couple times a year. I watch almost every game that’s on television.Just absolutely love the game. I watch hockey every time there is a Leaf game on, I watch all playoff games, and I especially love tuning in to Olympic hockey. Thanks for the great giveaway and good luck to all. I do not watch Hockey. I might see bits here and there when my Husband may be paying attention to it for a bit. whenever my home team is playing. I’d usually try and catch my home team when they were on, so one to two times a week. Not much, only when visiting someone who is watching it. I don’t watch hockey at all, unless i’m forced to! Only if Hubby is, which is very rarely that he watchrs hockey. Essentially never but my son watches every time a game is on. I mainly watch the playoffs and the Olympics. I don’t watch hockey very often. I usually check the scores when a team I like is playing and to see which teams are in the playoffs. when the NHL is actually playing I watch at least every Jets game (I have Jets TV!) I do watch others teams as well. Pretty much all the games the Canucks play on tv! I watch hockey only when the TML are playing. I watch hockey almost daily (during the season/playoffs) unless I have something way more important to do. I watch some of the playoffs! I don’t usually watch hockey. I watch hockey as often as I can. Only once in my life with attentiveness, in my peripheral vision I’ve seen a bit when others are watching, that’s about it! Normally all the time (pretty much all the Canucks games and most of the Oilers games) but I guess not this season…well hopefully they figure it out soon! I guess it’s just watching my husband play for now! Rarely watch it…Although my son does! Generally, we only watch it on a Saturday night. Occasionally we will watch a Leafs game during the week. Only if someone else is….